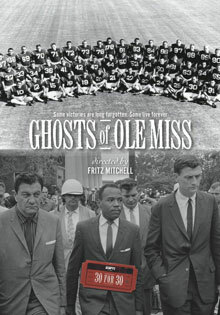 The documentary "Ghosts of Ole Miss" and follow-up discussion will take place at 10 am Saturday, Sept. 7 in White Hall. Emory Libraries will kick off a new "Race and Sports in American Culture Series" (RASACS) with a symposium Sept. 6-7, the first segment in a lineup of events inspired by the African Americans in Sports collection in its Manuscript, Archives, and Rare Book Library (MARBL). The symposium begins with a Sept. 6 keynote address by New York Times sports journalist William C. Rhoden, followed by a Sept. 7 screening and discussion of "The Ghosts of Ole Miss," and panel discussion with NFL Hall of Famer Willie Lanier and sports author/biographer Michael MacCambridge. RASACS is a joint project organized by Pellom McDaniels III, MARBL faculty curator of African-American Collections and assistant professor of African American Studies at Emory University, and Dana White, Emory emeritus professor of American studies and MARBL senior faculty curator. The series is a follow-up to Emory Libraries' first symposium on race and sports in American culture held in 2011, the year the African Americans in Sports collection was established in MARBL. "By bringing in people like Willie Lanier, we begin to deal directly with the stereotypes of the athlete, particularly the football player as the dumb athlete," says White. "We want the former athletes talking on their own behalf. Usually it's a scholar talking about the athlete or film representations, but to get people who were actually there at ground level, I think that's a main focus for us." Keynote address with William C. Rhoden, New York Times sports journalist. 6-8 p.m. in the Jones Room, Woodruff Library. Rhoden is author of several books, including "Forty Million Dollar Slaves: The Rise, Fall, and Redemption of the Black Athlete." He is expected to speak about the role of sports for African Americans in a changing global society. The address will be followed by a Q-and-A session, book signing and light refreshments. Film: "The Ghosts of Ole Miss" followed by discussion. 10 a.m. in White Hall, 301 Dowman Dr. on the Emory campus. The ESPN documentary is about the integration of the University of Mississippi with the attendance of James Meredith — which became one of the most shamefully violent incidents during the civil rights movement — at the same time the school's football team was bringing pride to the campus with an undefeated season. Panel: "The Evolution of the Game: How the 1970 Merger of the NFL and AFL Changed America." 1-3 pm in the Jones Room, Woodruff Library. Willie Lanier, NFL Hall of Fame (class of 1986) and the first African American middle linebacker in the NFL (Kansas City Chiefs). Michael MacCambridge, adjunct professor at Washington University in St. Louis, biographer of Kansas City Chiefs founder Lamar Hunt and author of "America's Game: The Epic Story of How Pro Football Captured a Nation." To encourage research in the area of race and sports on the Emory campus to coincide with the development of MARBL's African Americans in Sports Collection, part of its larger collecting initiative around African American history and culture. The series also will produce exhibitions, public programs, and an annual publication to support the research of graduate students, faculty and emerging scholars in the field. "This year's series has a full roster of presenters who deal with race and sports in American culture in very diverse ways," says McDaniels. "We have attempted to incorporate every unit from across the Emory campus – the college, business school, law school, medical school and programs such as the Center for Ethics." The series theme, which will continue throughout the 2013-14 academic year, is professional football, with events planned around significant NFL dates in September (season opener), February (Super Bowl weekend) and April (ahead of the NFL draft in May). Organizers plan to have the series revolve around a different theme each year, such as Latin America and sports, Title IX, or the ethics of intercollegiate athletics. Details about upcoming series events will be announced on the Emory Libraries website closer to the scheduled events. Wednesday, Nov. 13 - Opening and preview of the traveling exhibit "Joe Louis Barrow: A Life and Career in Context," focusing on boxer Joe Louis, whom White says was the first well-known African American athlete. The display will consist of approximately 12 panels featuring text and images of Louis, highlighting his childhood, his family's move to Detroit, turning professional, his key fights, and his years in the Army. Most of the images are drawn from various African American collections in MARBL. The opening is expected to include display cases of photos, fight programs and other materials, as well as film clips of his significant boxing matches such as the 1935 fight against Max Baer, his 1936 and 1938 bouts with Max Schmeling, and his 1946 match against Billy Conn.
Friday, Feb. 7, 2014 (coinciding with Super Bowl weekend) - Lecture: "The Great Sports Spectacle: Marketing the Super Bowl," by Kenneth Shropshire, author and professor of legal studies and business ethics at the Wharton School of Business. This event is a planned collaboration with Emory's Goizueta Business School. Wednesday, April 9, 2014 - Lecture: "Dying to Compete: Sports, Commerce, and the Future of Brain Injury Research," by neuroscientist Don Stein of Emory University School of Medicine. Stein is a leading brain injury researcher who has spent the last few years studying the effects of progesterone on traumatic brain injury, with positive results. For more information about the symposium, email Pellom McDaniels at or Dana White.